Save by buying in bulk! 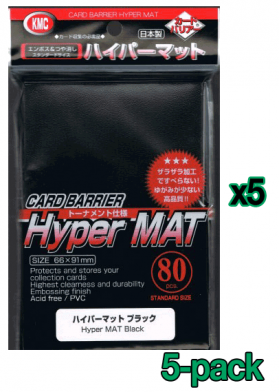 Five 80-packs of black sleeves for 400 sleeves total. Divisible by 100 and perfect for EDH/Commander decks. KMC Hyper Mat (Matte) card sleeves have an extremely matte back, are extremely low gloss, and are perfect for tournament use. They are produced to the highest quality to reduce gloss and increase strength. They are considered to be the least slick sleeves on the market; making them the easiest sleeves to shuffle and keep stacked. They are .12mm thick. Standard size sleeves (66mm x 91mm) fit cards from the following games: Magic: The Gathering, Pokemon, Race for The Galaxy, Thunderstone, Pandemic, World of Warcraft TCG, Chaotic, Naruto, Lord of the Rings, and more!